In 1994, I had just graduated college and was living in Williamsburg, Brooklyn. During the day I worked my first job in the film industry – interning in the editing room of a film called Surviving the Game (starring Rutger Hauer, F. Murray Abraham, Gary Busey and Ice T … yes, you read that list correctly). At night and on the weekends, when I wasn’t bartending, I was attempting to make a living as a custom hand-bound book artist. This is the long way of saying I was ridiculously flat-out broke. 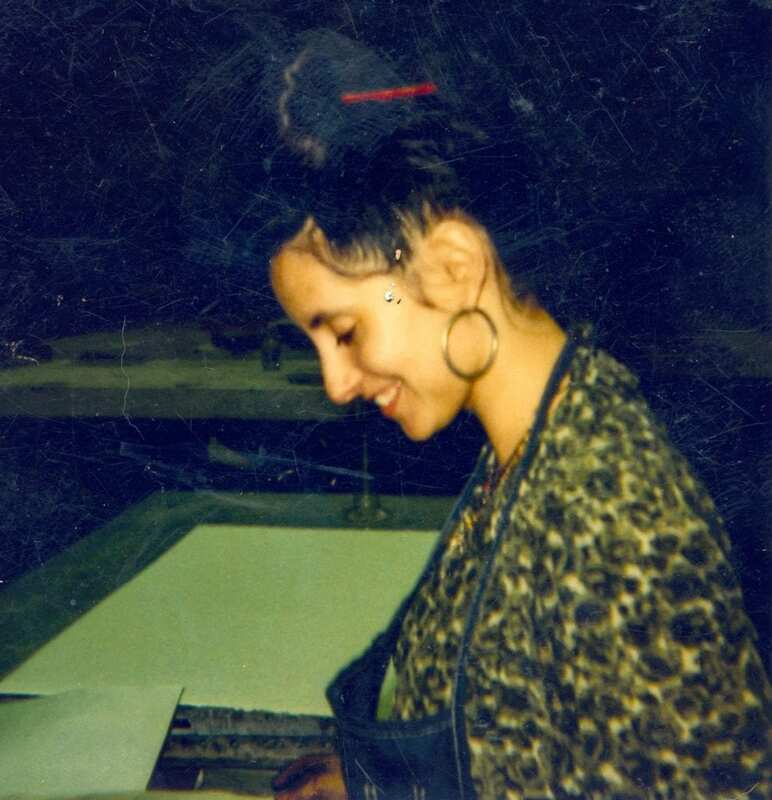 My partner in book-binding, loft-living and cooking on a budget was my best friend from college, a beautiful and talented artist from Colombia named Adriana, who sadly passed away in 2004. She and I spent countless hours in her loft (a former fish-canning factory which, worryingly, always smelled a little like anchovies when it rained). We laughed at a million stupid jokes, bound hundreds of books, watched many episodes of the X-Files and ate a gazillion Colombian-style arepas, slathered with butter and salt (or sharp cheese and guava paste, Adriana’s favorite). Not to get too emo on you but looking back, I realize what a formative and precious time those years were. It taught me that I can make anything, including furniture. I learned that film editing is basically magic. And most importantly, I learned that when you cook with people, what you learn from them stays with you forever, so they’re with you forever. Whenever I miss her I make arepas. I make arepas often. The tops won’t get dark brown, but a few toasty, burnished spots are just right. 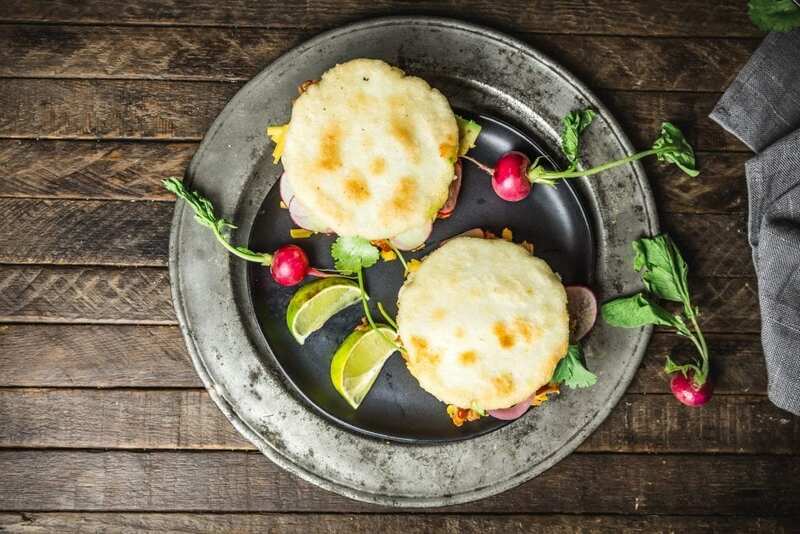 Colombian-style arepas are usually quite thin and crispy, with the ‘fillings’ mounded on top. 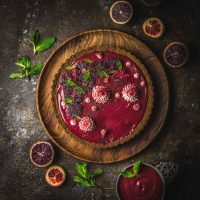 The ones we made here are closer to the Venezuelan-style which are thicker and can be split open and filled with all sorts of yummy bits and bobs (we give a list of ideas below). The outside gets nice and crispy, but the interior is soft and almost creamy. So delicious. If you’re not experienced in cooking with corn flours, the main thing to watch out for is the type of flour: for arepas, you need masa repa (not to be confused with masa harina, more on which below). 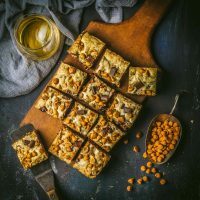 Masarepa comes in white and yellow varieties, using different varieties of corn, but there’s no difference in taste or texture – use whichever you personally prefer. Unlike cornmeal (which we use for polenta and corn breads), masa repa has been pre-cooked, and easily forms a pliable dough when water is added. 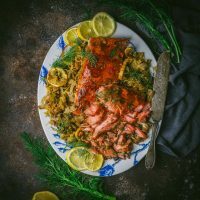 (Masa harina, another type of Latin/South American flour, is what you’d use for Salvadorean pupusas, Mexican gorditas, tamales, and soft corn tortillas, but it’s not what we’re after here.) Because masa repa flour is cooked, it’s fairly shelf-stable, but once you’ve opened the bag, it’s best to keep it sealed and air-free, preferably in a hard plastic container. The process could not be easier – add warm water (and a little salt) to the flour and mix with your hands until all the water is absorbed. We like to let it sit and rest for a couple of minutes before we make the patties. Then divide the dough, roll into balls, and flatten the balls to about a half inch thick disk. Heat a thin layer of oil in a skillet and cook them on one side until they crisp up and brown in spots, then flip and cook the other side. Easy peasy. 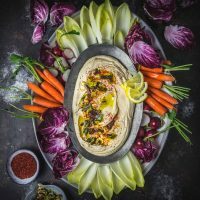 You can also mix a little shredded cheese into the masa dough itself if you want to infuse it with more flavor – and once cooked, you can split and slather the halves with good salted butter for a super-simple snack. Layer them up with whatever you like on a taco, or your favorite sandwich. We wanted to make a quick and easy meal out of it, so we opted to fill it with the simplest, tastiest BBQ Pulled Chicken we know how to make (essentially shredded rotisserie chicken breast tossed with sautéed onions, garlic and a few glugs of bottled or homemade barbecue sauce). If your bottled sauce tastes a little flat, you can add a little honey and vinegar to perk it up a bit. This is barely a recipe but so satisfying nonetheless. 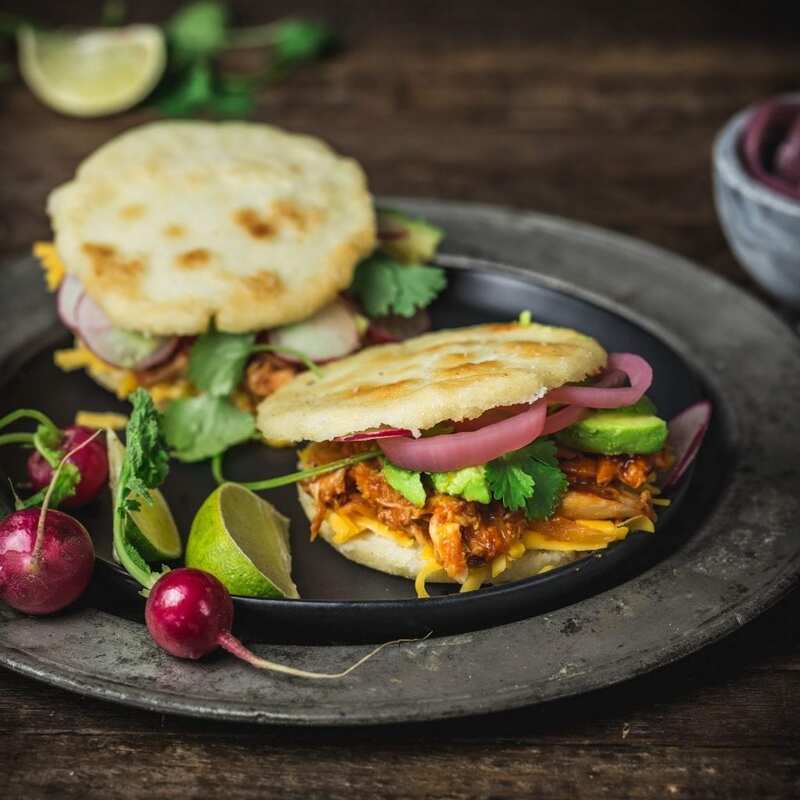 Along with the chicken we layered our crispy arepas with extra sharp cheddar cheese, tangy pickled red onions, creamy avocado and lots of fresh cilantro. The whole process, including the BBQ chicken, takes less than half an hour so it’s one of the tastiest weeknight meals we know of. We usually make a big batch of arepas so we can have them for the next few days – to reheat, warm them on a baking tray in a 250ºF oven for about 15 to 20 minutes or until hot. If frozen, let them defrost in the refrigerator before warming them in the oven. Once they’re hot, the possibilities are endless. 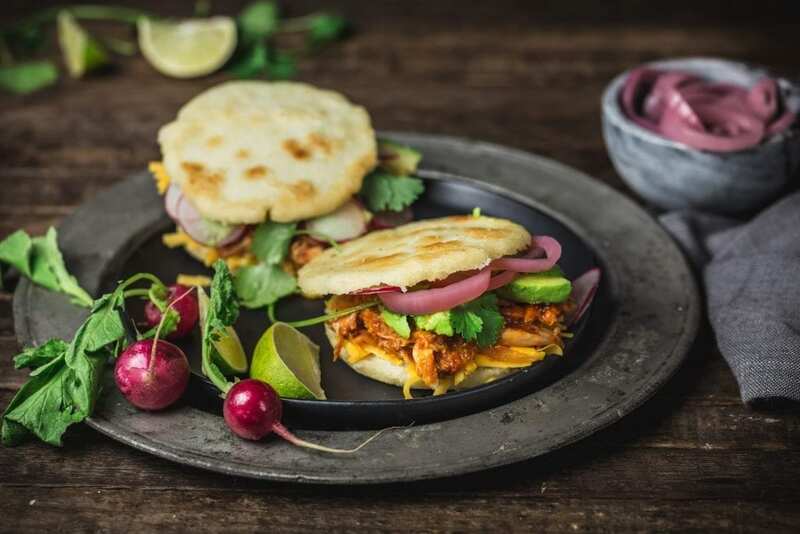 Arepas with super easy pulled BBQ chicken, sharp cheddar cheese, tangy red pickled onions and creamy avocado. Make the Arepas: Add the cornmeal and salt to a medium bowl and stir in warm water. Whisk until no lumps remain and water is fully absorbed. Let the mixture sit for 5-10 minutes. Divide the dough into 6 even pieces and roll each into a ball. Flatten each ball to create a disk about ½ inch thick. Set a large (10 or 12 inch) heavy skillet over medium heat. Add a layer of oil (about ¼ inch deep) and heat until oil is shimmering but not smoking. Add as many arepas as will fit without crowding the pan and fry for about 4-5 minutes on each side, until arepas are crisp on the outside, and brown in spots. Remove from pan and set on paper towels to drain. Make the Pulled BBQ Chicken: Add oil to a medium skillet set on medium-high heat. When oil is shimmering, add onions and cook, stirring often, until onions are soft and just starting to darken. Add garlic and cook for 1 minute. Add the barbecue sauce and heat until simmering. Add the pulled chicken, stir to coat with the sauce and cook until heated through. Taste, and add vinegar and honey to taste, if needed. To assemble: Cut the arepas in half horizontally (as you would an English muffin) and add shredded cheese and about ¼ cup pulled chicken. Top with avocado and pickled onions. Top with other half of arepa and serve warm.